1: READ THE BIBLE LIKE ANY OTHER BOOK – The Bible does not take on some special magic that changes basic literary patterns of interpretation. 2: READ THE BIBLE EXISTENTIALLY – We ought to get passionately and personally involved with what we read. We should seek to “crawl in the skin” of the characters we are reading about so that we get absorbed into the world of the text, so that their world begins to shape us. By trying to put ourselves in the life situation of the characters of Scripture, we can come to a better understanding of what we are reading. This is the practice of empathy, feeling the emotions of the characters we are studying. Such reading between the lines may not be regarded as part of the text of Scripture itself but will aid in our understanding the flavor of what is happening. 3: INTERPRET THE HISTORICAL NARRATIVES BY THE DIDACTIC (‘Teaching’ or ‘Doctrinal’ Passages) – The term didactic comes from the Greek word that means to teach or to instruct. Didactic literature teaches or explains. Much of Paul’s writing is didactic in character. The relationship between the Gospels and the Epistles often has been defined in simple terms of saying that the Gospels record what Jesus did and the Epistles interpret the significance of what He did. It is true that the emphasis in the Gospels is found in the record of events, while the Epistles are more concerned with interpreting the significance of those events in terms of doctrine, exhortation and application…The principle of interpreting the narrative by the didactic is not designed to set apostle against apostle or apostle against Christ. It is merely recognizing one of the principle tasks of the apostle, to teach and to interpret the mind of Christ for His people. 4: INTERPRET THE IMPLICIT BY THE EXPLICIT – When an implication is drawn that is contradictory to what is explicitly stated, the implication must be rejected. If we interpret the clear in light of the obscure, we drift into a kind of esoteric interpretation that is inevitably cultic. The basic rule is that of care: careful reading of what the text is actually saying will save us from much confusion and distortion. 5: DETERMINE CAREFULLY THE MEANING OF WORDS – Only the context can determine the particular meaning of a word. 6: NOTE THE PRESENCE OF PARALLELISMS – Parallelism may be defined as a relationship between two or more sentences or clauses that correspond in similarity or are set with each other. There are three basic types of parallelism: synonymous, antithetic, and synthetic. And he who tells lies will not escape” (Proverbs 19:5). Let us kneel before the LORD our God our Maker” (Psalm 95:6). Antithetic parallelism occurs when the two parts are set in contrast to each other. They may say the same thing but say it by way of negation. But a scoffer does not listen to rebuke” (Proverbs 13:1). But the hand of the diligent makes rich” (Proverbs 10:4). Synthetic parallelism is a but more complex than the other forms. Here the first part of the passage creates a sense of expectation that is completed by the second part. It can also move in progressive, “staircase” movement to a conclusion in a third line. All who do iniquity will be scattered” (Psalm 92:9). and do not turn away from him who wants to borrow from you” (Matthew 5:42). knock and it will be opened to you” (Matthew 7:7). 7: NOTE THE DIFFERENCE BETWEEN A PROVERB AND A LAW – Proverbs are catchy little couplets designed to express practical truisms. They reflect principles of wisdom for godly living. They do not reflect moral laws that are to be applied to absolutely every conceivable life situation. 8: OBSERVE THE DIFFERENCE BETWEEN THE SPIRIT AND THE LETTER OF THE LAW – Jesus goes beyond the letter to the spirit of the letter. The Pharisees noted only the letter; Christians are to take note of the both the letter and the spirit of the letter. 9: BE CAREFUL WITH PARABLES – Some parables are extended similes, others are comparative stories, and still others have an obvious moral application. The safest way to look at parables is to look for one basic central point in them. 10: BE CAREFUL WITH PREDICTIVE PROPHECY – If we examine how the NT treats the OT prophecy, we discover that in some cases an appeal is made to the fulfillment of the letter (such as the birth of the Messiah in Bethlehem) and in others fulfillment has a broader scope (such as the fulfillment of Malachi’s prophecy of the return of Elijah). When interpreting Apocalyptic literature (e.g., Daniel, Ezekiel, Revelation) it’s important to seek the general meaning of such images in the Bible itself. For example, most of the images of the book of Revelation are found elsewhere in the Bible, particularly in the Old Testament. 11: INTERPRET THE BIBLE WITH A SPIRIT OF HUMILITY – We must humbly acknowledge the possibility that at some points we could be mistaken…If my views cannot stand the test of objective analysis and verification, humility demands that I abandon them. *Adapted from Chapter 4: “Practical Rules for Biblical Interpretation” from R.C. Sproul. 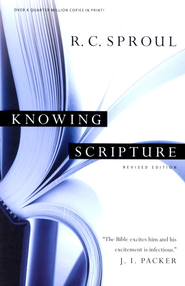 Knowing Scripture. IVP: Downers Grove, IL. : 2009.